Curumim is a piece of ransomware that can easily compromise your valuable information. The Curumim ransomware encrypts photos and other documents so that its creators could ask for a ransom. Interestingly, this ransomware threat does not provide much information or instructions in its user interface, which contains an animated character known as Curumim. The Curumim ransomware is a computer infection created for financial gain. The people behind this infection are not likely to bother to decrypt your files after you make a payment for restoring your data. Hence, you should now focus on the removal of the Curumim ransomware and preventative measures against future malware-related incidents. 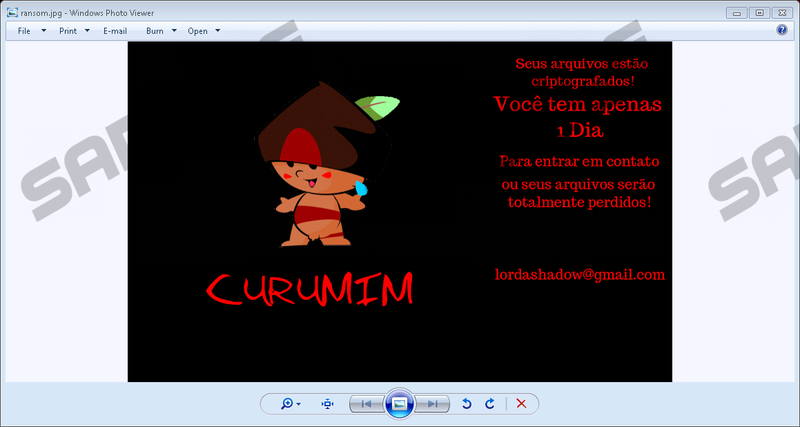 The Curumim ransomware displays its pop-up warning written in the Portuguese language, which suggests that the threat targets a specific group of computer users. In addition to the pop-up warning, the ransomware also creates the file leai.txt. Unlike other ransom warnings created in the .txt format, the leai.txt file provides a victim with very basic information. All that a victim is instructed to do is contact the attackers via email for more information. The odds are that the price for decryption varies depending on how quickly a victim contacts the attackers at lordashadow@gmail.com. Typically, a ransomware victim is demanded to purchase a certain sum in Bitcoin, which is a digital currency that does not have a central bank or issuer. Cyber criminals take advantage of such a system to remain unidentified. Prepaid vouchers was popular several years ago, and recently one ransomware infection demanding pincodes of a prepaid vouchers has been spotted by malware researchers. If you do not want to lose your money, you should not get involved in purchasing digital currency or vouchers for regaining access to your data. There is no guarantee that those crooks will spend time helping you to decode your files. Remove the Curumim ransomware from the computer as soon as you can and make sure that this does not happen again in the future. If you do not keep the system protected against malware, your PC can be easily infected by another ransomware or any other threat. The Curumim ransomware is built created using the ransomware building kit Hidden Tear, which is known as open source code. The number of ransomware infections based on this code is rapidly increasing since more and more script kiddies want to put their hands on the code. The Hidden Tear project was created for educational purposes, and it was closed down shortly after its release, but black hat hackers are still distributing it, which results in new releases of Hidden Tear-based threats. The original code allowed hackers to create ransomware that encrypts files only in a certain directory on the desktop. The latest Hidden Tear infections deviate from the original code. They are capable of encrypting files located in different directories and are also programmed to use other encryption algorithm than AES encryption. Malware attacks can be averted by implementing some changes regarding system security and the user's behavior. Malware, including ransomware, is spread via email and software bundles, and that means that a lot of attention should be paid to the content provided by emails and software installers. You should disregard questionable emails and bypass freeware software sharing websites. Moreover, it is also important to keep the system up-to-day, because there are numerous threats that have already affected operating systems that were not updated to the latest versions. You should also keep in mind that software has to be updated whenever it is possible. More important, the operating system should be protected against malware, which is grouped into different categories defined by specific characteristics. The Curumim ransomware is one of the many threats that get on the computer stealthily and make unauthorized changes within the system. If you want your data to be safe while you are browsing the Internet, you should keep the system protected by a reputable security tool. Our advice is to install the tool recommended below, but if you want to try your skills in removing the infection manually, use the following removal instructions. One last advice is that you scan the system after removing the Curumim ransomware to make sure that the system is malware-free. If you should happen to encounter a difficulty with the removal, feel free to leave a question in the comment box below. Delete the .txt file created by the infection. Delete all recently deleted files from the desktop. Check the Downloads folder for questionable files. Empty the Recycle bin after deleting all unwanted files. Quick & tested solution for Curumim Ransomware removal.